Most people in Britain think our society remains divided – but they also agree that the arts can help to bridge divides in British society, if it makes more effort to get out of London and big cities into towns across the UK. 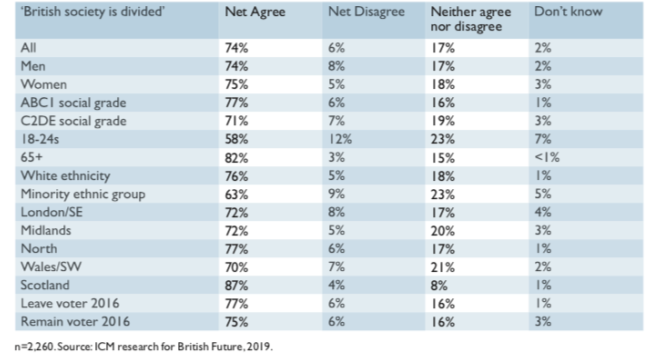 Three-quarters of those surveyed by ICM for British Future’s Crossing Divides: How arts and heritage can bring us together report agreed that ‘British society is divided’ – somewhat ironically, it is a point on which people right across society can agree. Yet there is a real public appetite for shared moments that can bring us together. The First World War centenary demonstrated how arts and culture, at such moments, can step up and be part of the answer to bridging these divides. A ‘fair funding’ review seeing more arts funding channelled into the north of England and into UK towns. New ICM research for Crossing Divides found that 72% of people who were shown a series of images from the 14-18 NOW programme felt the arts can bring people together in the UK, compared with 64% who did not see the images. Three-quarters (76%) of the population felt an arts programme across the UK to mark the First World War centenary was a good idea, including those least interested in history (62%) or the arts (69%) and across different social groups. British Future has also tracked public attitudes to the First World War centenary since 2013 and its latest tracker research finds that 51% of people feel the centenary did bring people together across the UK, with just 23% saying it did not. The 14-18 NOW arts programme showed how that can be done, reaching millions across the UK with a story that transcended divides by age, class and politics. It was good at things that the arts can sometimes struggle with – feeling connected to local communities and finding common ground between people from different backgrounds. Crucially, most of the events took place outside of London, bringing arts to our towns as well as big cities. It got out of London, with 81% of the programme taking place outside the capital and a real commitment to fill gaps in geographic coverage. Just 12% of people surveyed felt that the centenary arts programme was concentrated in London. Many events were also free and in public space, breaking down barriers to participation. The programme used volunteers, with 2,000 taking part in Jeremy Deller’s We’re here because we’re here, 1,400 of them dressed as First World War Soldiers. Many more events were participative, encouraging people to talk to people they didn’t know. Organisers also spent time building links with local communities. Media coverage, especially on TV, brought events to a mass audience, with stories and messages about our shared history that resonated across social divides. While we are often told that we live in the age of the ‘culture war’, and it is clear that people do feel divided. The Crossing Divides report draws lessons from the centenary for future national moments and festivals, for the arts more broadly, and for anyone committed to bridging divides and building a shared sense of identity across the UK.